The minority SNP government will need the support of at least one opposition party at Holyrood if it is to pass its tax and spending plans for next year. Scottish Lib Dem leader Willie Rennie said his party was due to begin talks with the government next week. But he warned it must "drop the referendum" to win his support. 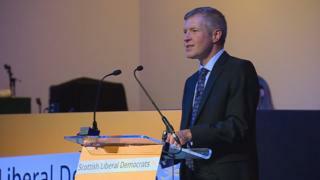 At the Scottish Liberal Democrat conference in Dunfermline on Saturday, Mr Rennie also announced that his party is backing a campaign for children in Scotland to start school at the age of either six or seven rather than four or five. The Scottish government's previous two budgets have been passed with the support of the pro-independence Scottish Greens. But Mr Rennie claimed the Greens were "threatening to stand up to" the government this year, leaving it with "limited" options for securing a budget deal. In his speech at the party conference, Mr Rennie said his "constructive, pragmatic" party had backed budgets in the past after securing extra funding for colleges, nursery education and free school meals. He added: "This year we will hunt for agreement once more. But let me be clear about this - we simply are not going to vote for an SNP budget that keeps an independence referendum on the table." Mr Rennie argued that Brexit "chaos" and the SNP's own Growth Commission report have "obliterated the case for independence". And he claimed that "everything good we want to do in Scotland will be harder with the big cuts that independence brings." First Minister Nicola Sturgeon shelved plans for a second referendum after the SNP lost 21 seats in last year's general election, with its share of the vote dropping from 50% to 37%. She has previously said she will make a decision on whether or not to call for another vote on independence in the autumn. But there has been speculation that her timetable could be further delayed by ongoing uncertainty over the terms of the UK's departure from the EU. Responding to Mr Rennie's comments, a spokesman for Finance Secretary Derek Mackay said: "When it comes to the budget Willie Rennie should be more concerned by the fact that this year two MSPs from his group of five voted against him to support the Scottish government's budget. "We will bring forward a budget that invests in our economy and delivers for public services right across the country - if the Lib Dems vote against that because of their constitutional position it will say a lot about where their priorities lie." Announcing Lib Dem support for the campaign for the age at which children start school in Scotland to be raised, Mr Rennie also said that international evidence shows that under-sevens need a play-based approach to learning with plenty of opportunities for active, outdoor, social, self-directed play. He argued that the controversial national assessments for P1 pupils "pulls Scotland in exactly the opposite direction" and he pledged to back parents or teachers who want to boycott them. Mr Rennie said: "Almost nine out of 10 countries in the world start formal education at the age of six or seven. Only a tiny fraction join Britain at such an early age. "That's why I want Scotland to join the majority of countries around the world. I want schools to be able to change the way we teach children aged four and five. We should start formal schooling at six or even seven."